Letter sent this morning to AERC Board of Directors. [Edited to add: Written, not by me, but a group of concerned members.] If you are a member and you agree with the sentiments in this letter and the members who signed it, it is not enough to hit “like” on Facebook, or make a comment saying you agree, or send me a note saying you agree wholeheartedly. 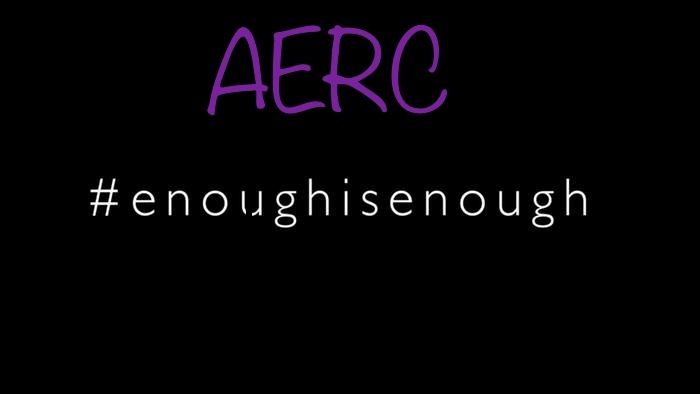 You must email your AERC Board of Directors (here’s the link to do so: Link to email AERC BoD ), provide them with your AERC membership number, the service you provide to the organization (Ride Manager, Veterinarian, Committee Member, Ride Volunteer, Trail Volunteer), and include “Enough is Enough!” in the subject line of your email. Feel free to cut and paste the contents of the letter if you like. Several long-time AERC members drafted a letter outlining our disenchantment with USEF/FEI international endurance. We sent the letter to a number of AERC members who have contributed a great deal to the organization and who we believed would want to join us as signatories. We were not surprised at the overwhelming positive response. Most replied “YES” or “add me.” We believe the majority of AERC members share the sentiments expressed here. We’ve added Troy to this distribution to request publication of the letter in the next issue of Endurance News, in an attempt to reach AERC members who do not frequent social media or the internet. We understand that the Executive Committee and AERC-I Committee have sent a letter to USEF, requesting changes. Unfortunately, we have all been witness to the previous letters, and the lack of substantial response from USEF/FEI. It is time that we step away; these are not our egregious issues to fix. Let’s determine our own destiny and show our members as well as the world that we have had enough and will no longer support USEF/FEI endurance until they can improve and enforce their rules. Many of us within AERC recall with pride when endurance became an international-level sport. This evolution, however, has resulted in changes we can no longer tolerate or support. We have observed with growing alarm years of corruption, egregious issues regarding horse welfare, attempts to influence through example, pleas to stay at the table, and letters, motions and new rules to address the problems to no avail. We have lost confidence in these efforts to produce real change on the actual field of play. The issues associated with international endurance continue growing within our sport. High emotions are dividing us, and the dilemma is compromising the sport we love. The recent World Equestrian Games, held on American soil, were not officially sanctioned by AERC, but relied on the support of many of our riders, horses, veterinarians, and members. Many sensed a coming disaster but had no power to prevent it. AERC sent a letter to USEF, expressing concern about a “level playing field.” Connie Caudill, a member of the AERC Board of Directors, initiated a Change.org petition demanding FEI make changes to tangibly ensure equine welfare. That petition has garnered well over 5,000 signatures. Despite the fact that the Tryon WEG was not AERC-sanctioned, our sport will forever be tarnished by this event. The competition was mired with avoidable controversy and competitors were denied a level field of play. We urge the AERC Board of Directors to respectfully decline executing the affiliate endurance organization contract/agreement with USEF until such time as FEI has made significant and tangible changes to enact and enforce rules consistently, without favoritism or undue influence by sponsors. We ask that international endurance cease to be run over courses allowing unfettered speed demanding few exceptional skills. Lead us in our return to more tempered, elite competitions over challenging, technical terrain that tests the finest in horsemanship, athleticism and strategy. There is much that can be done to improve our sport in the USA and Canada as AERC. Let us focus on using our voice and actions to demonstrate to the world that we are different from what they saw at WEG. The AERC National Championship, just a week later, showed how elite events can and should be run. We hope other National Federations will see AERC as a leader true to the foundation of our sport and invite them to work with us in building a new vision of international riding, following in the footsteps of the Young Rider International Exchange Program, without the taint of USEF or FEI involvement. Our AERC members and horses deserve a sport truly modeled after our motto, To Finish Is To Win. We call upon you to lead us forward out of the mire and into a future true to our integrity. We invited other AERC members to add their names to the original signatories starting on 11/09/2018. We’ll be updating the letter as their names are added.